Nigel Bradham is a "dumbass" no more. It's been almost two years since Philadelphia Eagles linebacker Nigel Bradham was arrested twice in the span of 69* days for felony assault after he allegedly attacked a cabana boy in a dispute over an umbrella, and was arrested for forgetting that he had a loaded gun in his carry-on bag at the airport. 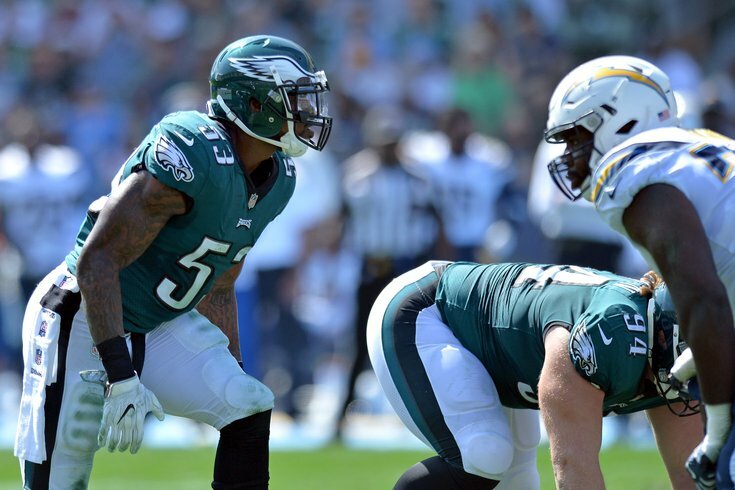 "If you do dumbass things, pretty soon you're going to be labeled a dumbass," defensive coordinator Jim Schwartz said about Bradham at the time. On Tuesday, Schwartz had much more positive things to say about him. "He's been the heartbeat of our defense," said Schwartz. "He's a guy that plays with a lot of emotion. He's a guy that, for lack of a better term, talks a lot of trash during the game. Gives us a lot of energy. He played some games this year. I think he ran about five extra miles just to get to the ball to talk. "But that's what gives him energy, and we feed off of that as defense also. Nigel's always brought that. But the biggest contribution last year that he had taken a big step was being the defensive play caller when Jordan [Hicks] went down. A lot of times having to sort of temper that or temper his enthusiasm, be able to get all the calls, play multiple positions, that kind of stuff, I think those were all important things that he brought to our defense." Bradham played under Schwartz for a year in Buffalo, and became one bright spot among many former Schwartz guys signed to the team in free agency. "Our relationship is very strong, obviously," said Bradham. "We kind of bonded from day one. He's always liked my style and energy." Still, there's room for improvement. During Jason Kelce's epic speech on the Art Museum steps in which he mocked criticisms of various players, Kelce bellowed, "Nigel Bradham, can't catch!" Well, that one was correct. "I think the number one thing that we'd like to see him do a little bit, and the thing is, he's got really good hands, but he needs to finish more of the plays that he could have made for us," Schwartz said. "We've had a lot of talks about that this off-season. Actually, we haven’t really had them, he's brought that up and wanting to finish those plays. I probably have a few gray hairs that I might not have if he had sealed some of those pass break-ups as interceptions. So I think that's probably the biggest thing for him." If Bradham can make more splash plays in 2018, he's yet another Eagles player who could earn Pro Bowl recognition.